Large textured shelves hold and reduce slippage of a variety of equipment and supplies. 300 lbs total load capacity, 100 lbs per shelf. The Rubbermaid Commercial 4093 Utility Cart with Enclosed End Panels on 3 Sides, Black. 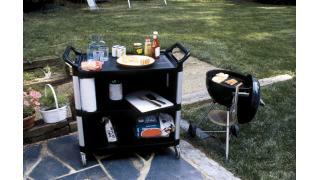 300 lbs Load Capacity, 40-5/8" x 20" x 37.8". Rounded corners won't damage walls. 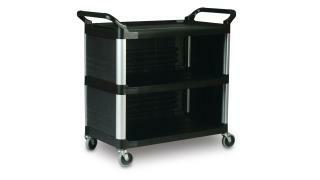 Upscale appearance is ideal for institutional, warehouse or front office use. Durable resin construction resists scratches, chips and rust. Lightweight and easy to handle with quiet, nonmarking casters. Comfortable, rounded handles. Measures 40-5/8" length by 20" width by 37.8" height.